Several People have left comments on my site about how to convert low voltage lights to solar power. This post will discuss the pros and cons to this switch. Saving money or the planet will not be the reason that you make this switch. Need to have another reason, like the remote location of the lights or you want to be different. You will need several items to start with at least one Solar Panel, a Rechargeable 12 volt battery, a diode to keep the current running in one direction and a controller for your lights. I will break down the specks on what to look for and give you kit information. Lets get started with the solar panel. The solar panel will need to charge the 12 volt battery below to the point it will have enough energy to keep your lights on for the desired time. You will need to determine the amount of amp hours that you will need. This is determined by multiplying the number of fixtures by the wattage of the fixtures, then multiply that figure by the number of hours you need your lights on. This sounds complicated, not really if you look at this example. If you had four 7 watt fixtures and one 10 watt spotlight that would be a draw of 38 watts. If you wanted five hours of lighting you would have a draw of 190 watts for each day. This would be multiplied by two to get the total watts used to 380. You always have to have double the power in case the sun does not shine very brightly. Now you know how much solar energy that you will need daily. Take your average daylight hours and divide that by the 380 watts you need and the size of the solar panel will be determined. In this case if you had 7 hours of sunlight per day you would need at least two 30 watts 12 volt solar panels. There are a lot of solar panels that charge for 12 volts, most are used to charge camper or boat batteries while they are in storage. You will need to purchase a large 12 volt battery that will hold enough energy to power your lights all night long and not poop out quickly. A marine or RV type of deep cycle battery will work the best, they are not cheep or small. You could see if you can get a used one on one of the resale networks. Having a place to store it out of the weather will be next on your list. Several Battery boxes are available. You will have some options here, you can have a dusk to dawn or a timer. The dusk to dawn will let you have light until the battery power goes to a level that no longer powers the lights. The timer can be set to power the lights when you need to use them. A dual timer will be able to light the lights at night and again in the morning if you have to get up and go to work before the sun does. Motion sensors can be used also, these will allow you to illuminate you area only when needed. There are some kits available, most are only the Solar Panel and wire to connect to the object that needs power. These kits are made to operate some kind of feature that will only operate during the day light hours. You can buy bigger solar panels for you house and convert to 12 volts for your lighting system, this seams like over kill. My ruling on this is to buy a set of Solar Lights and do not convert the Low Voltage lights. This process is time and money consuming and it will take years of use to get your investment back. 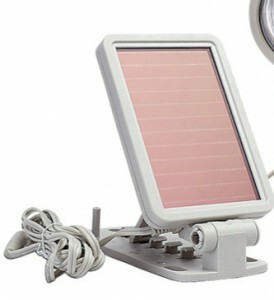 Solar Lights are a good investment, just keep the Solar Panel clean from dust/dirt and make sure you get plenty of sun. I know this is not what a lot of you were looking for, this is my opinion. Any questions or comments about this post, please use the form below. This is some good information on converting low voltage lights to solar power. From your article it seems like the conversion uses a decent amount of relatively expensive components. What are your thoughts on some of the lights that have the solar panels built into the top of them for landscaping and pathways? As stated in the article, I would use any solar light set over the conversion. The higher the amp hours on the batteries, the longer life you will get from the fixtures. Maintenance is key with Solar power. You must keep the panel clean and replace the batteries when needed. I have always been interested in solar power lighting and this is a great step by step method of informing others how to properly use it. Are you familiar with placing larger solar panels together that can be used to light houses efficiently? I know people that are doing it but I was wondering if it worked the same way as the way you have described it in your post. It is very similar, storage of energy /electricity is done by battery or selling it to the utility companies and then buying back what you need when you don’t have any sun. Great write up on changing low voltage lights to solar power. I would have to agree with you, that it is more hassle than it is worth. You are much better off just buying solar lights to start out than converting existing ones. Not to mention if you mess something up it could cost you a lot more than you bargained for. I had several questions from comments asking if this could be done. The answer is yes, just not very economical. You will never get your money back from the battery that you have to have to make this work. LED Solar Lights in a kit or similar work better than low voltage as long as they are maintained. I would say you covered all the key information on answering what it would take to set up some solar lights to use in your outdoor space if you did not what the typical systems. You addressed the issue very well to what I would need to do or get to make it happen if solar was the way I wanted to go and you have me thinking about the possibilities. Good informative post and you have me thinking! This question came up in several comments. I personally think that the conversion is not worth the time and money you have to put into it. I would suggest that getting a set of solar lights is the best way to go. All of this is good info but some of us do not have enough sunlight to recharge even a large panel solar light. We see solar lights kill the built-in batteries constantly because they discharge completely so often. It only takes a couple months during the winter to have them die completely. This article was for those looking to change the power source for their outdoor lighting. It will not work for everyone. If you live in an area where the sun is not a good power source, low voltage landscape lighting will be the best solution for you. Not being able to see the project you have, it will be hard to determine how to help you. Running low voltage lighting wires is not that hard. If you have existing wiring, just get some replacement wire, 16 gauge would be the best. I have an article on running wire here. Run the new wire where the old wire was. If you need a new transformer see my information here. Most low voltage sets can be installed without a landscaper. Most transformers are plugged to a ground fault plug that will need reset if it has been tripped. I would check the transformer first before running new wire, if one of the lights work check the bulbs before wires also. The wire that connects to the transformer will get corroded over the years and not allow current to flow properly also. If you feel uncomfortable with the idea of working with the wires and stuff, I would recommend looking for a local company that does low voltage lighting. If your gate is working, you have a power problem to the light fixtures. Two things would be of concern for me not seeing your system setup, the length of the wire run and if you have a broken wire somewhere in your wire run. Length of wire will effect the voltage at the fixtures, the smaller the wire in gauge, the more voltage drop you will get. How long is your wire run and what gauge wire did you use. You must use the same chart for wire runs as low voltage wires to make this work. I do have some examples of what will work on my website under low voltage wire runs. The second thing I would look at is if you have a broken or shorted wire in your run. I have no idea if your wire is run under ground or it is attached to a fence line to your fixtures. 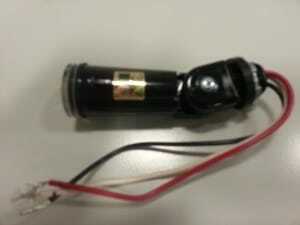 A simple voltage tester will let you know if you have some voltage, you can even use one that has two wires and a bulb. Check the voltage at the power side of the sensor to make sure it is getting there. Check on the out put side of the sensor. If you are getting voltage out of the sensor, you may have a broken wire to the fixtures. Then check at each of your fixtures. A broken wire could be caused from insects or small animals. Don’t be afraid to ask any more questions. Without pictures or length of wire run it is hard to give you very good advice. My issue is I have an area that only gets 2-4 hours of direct sunlight a day. it is a walkway between 2 garages. I don’t want to have to run low voltage wire for regular lights. but I don’t think I have enough direct sunlight to operate solar lights. Any other suggestions? Some solar lights come with a remote solar panel that connects to the fixtures. I have used one for light inside my shed before. You can place a solar panel where it gets light for power and run the cable to the fixtures. It is somewhat like low voltage lights without having to have a need for a 110 volt power source. Sorry for the late response, was at scout camp the last week.